I don't like him. He looks a bit shifty. Nice design coloured feathers. Were they tailor made? Nice design coloured feathers. Were they tailored made? It looks like he has a good tailor, doesn't it? 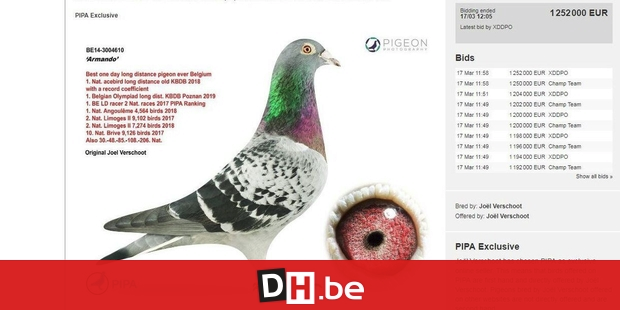 i hear pigeon racing is a serious sport in some parts of the world , lol., 1.42 million $ for a pigeon . is the prize money in pigeon racing that good to make an investment like that i mean it's not like horse racing is it ? , that i understand ..... with prize money & breeding fees the payoff can be worth it but pigeons ? their is a race called the SOUTH AFRICAN MILLION DOLLAR pigeon race , just looked at some online articles about the sport & it is serious business . the sport has it's shares of doping scandals , cheating , etc . it seems that the hallowed sport of pigeon racing is just as corrupt as any other sport ( i'm looking at you ) my beloved harness racing .